Today, you can easily spend a huge amount of money on holiday decorations: Halloween decor that becomes an eyesore on November 1, Thanksgiving decorations that become unseasonal 3 weeks later, and Christmas decor which is appropriate for 5 weeks at best. GOAL: More home-made, less big-box decorations. GOAL: Seasonal, not holiday decorations. “Seasonal” decorations on my deciduous trees meant I could leave the decorations up much longer than “holiday” decorations. Simply having “winter” “summer” and “fall” decor is much easier, cheaper, and requiring of less storage space than trying to decorate seasonally. 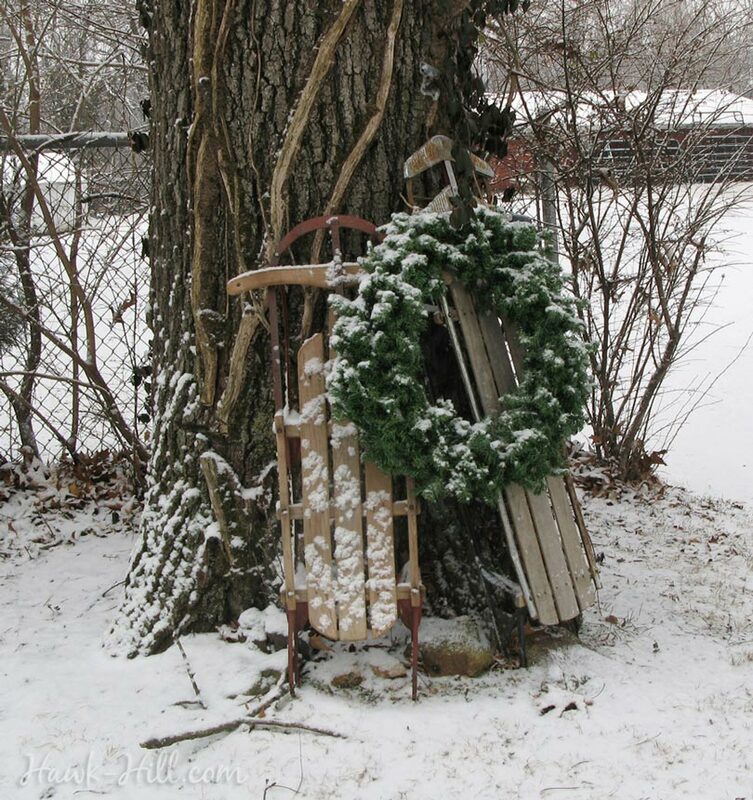 Unlike “Christmas decorations” that look unsightly if left out into January, seasonal non-holiday decor gracefully transitions into late winter. Many older homes have stately elms, maples, or oaks regally placed in a front yard or stately lining a driveway. 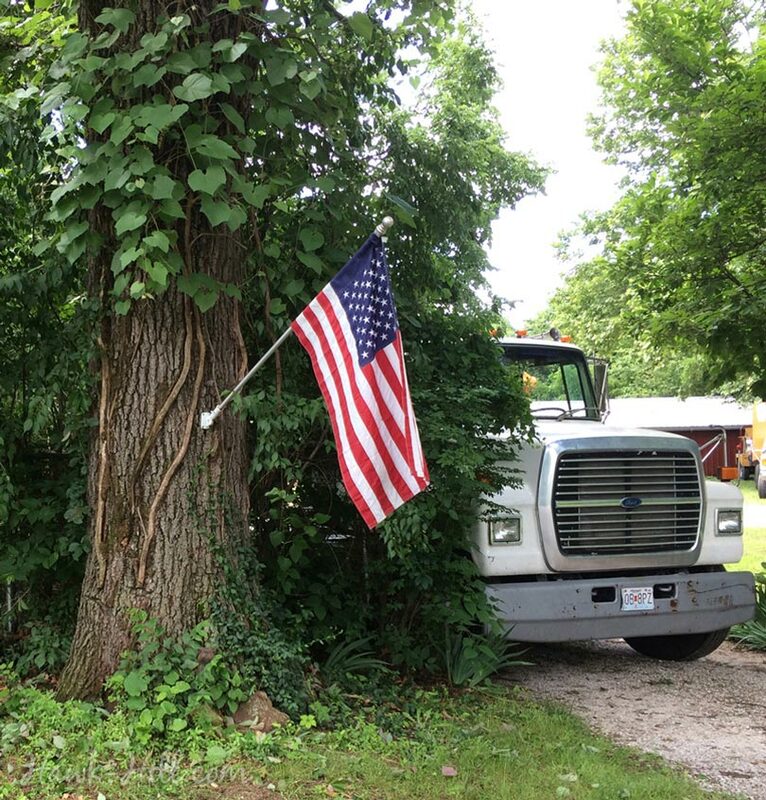 My property in Missouri was one such property. 5 century-oaks stood on the property when I purchased it (one of which we recently lost but repurposed the hardwood into a mushroom garden). Each of these trees, along with Hawk Hill’s three porches, was a canvas for seasonal decor. A casual pile of homemade faux-wool blankets, ice skates, and other seasonal items make this porch cozy and holiday-appropriate from November through February. Two of our century oaks stood within spitting distance of my driveway, and over the years that I lived and loved my farm, I had a lot of fun playing with alternate ways to decorate these trees seasonally. 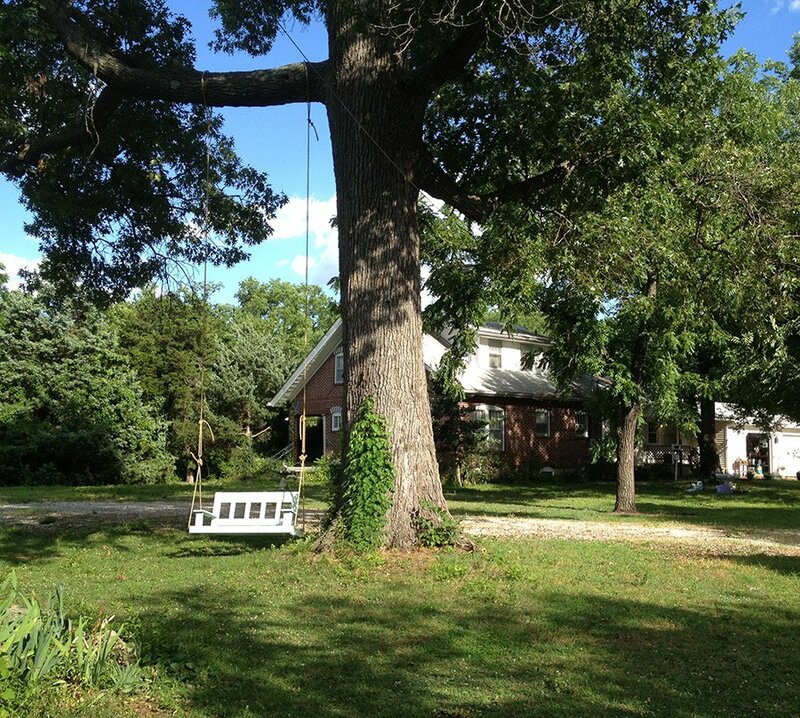 Functional and classic summer decor, a mature tree with strong limbs can support a rope swing or even a porch swing. The flag bracket does double duty, in the winter functioning as a hook to hold a sprig of artificial greenery and a real pair of white vintage ice skates. These skates usually stayed up all winter- from post-thanksgiving into March- requiring no Maintenon other than cleaning and reviling the leather once a year before storing for the summer. 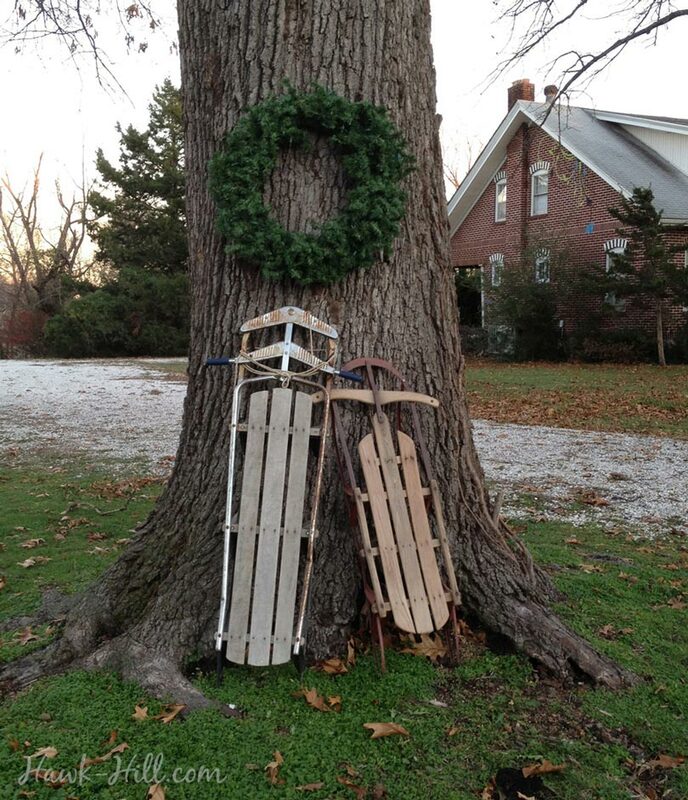 Purchased for $25-$50 depending on quality, vintage sleds leaned against a trunk can make a great decoration for a deciduous tree. (If you are in an urban area you may want to use a bike lock and cord to secure your sleds around the trunk, through the runners) Sleds can stay up from Thanksgiving through early spring . Using real sleds rather than cheap reproductions looks so much better- but does require just a bit of maintence. About every two years, before storing my sleds for the winter I condition the wood with a beeswax based conditioner and rub oil on the runners to protect against rust. 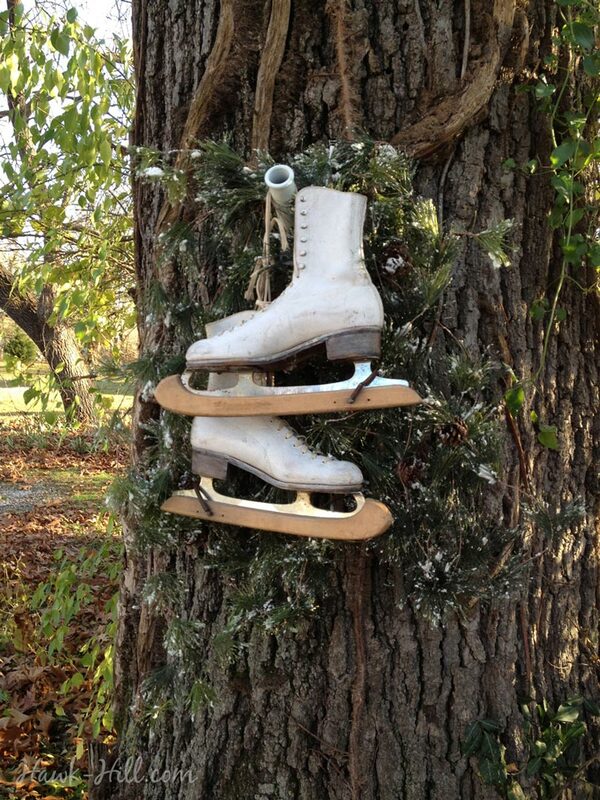 Here’s another example of using a deciduous tree to display vintage sporting goods in a seasonal/holiday display. 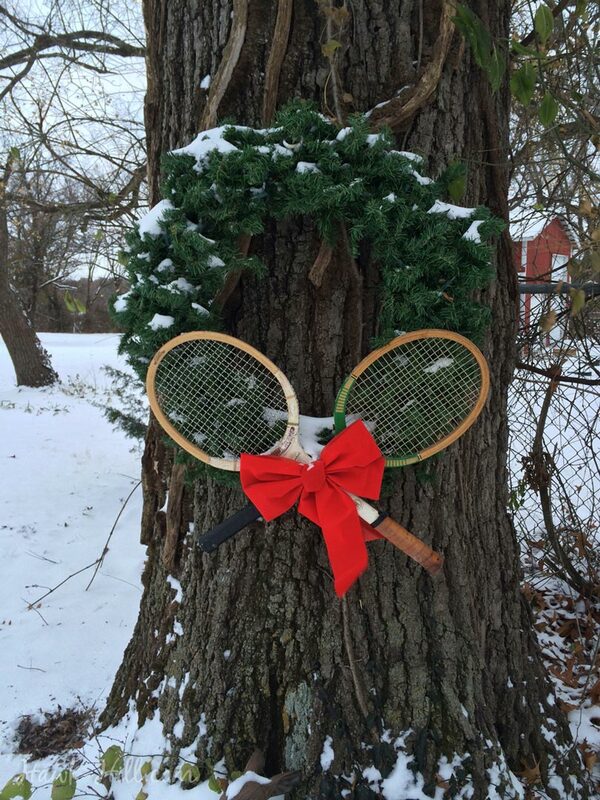 In this photo, I used what I had to create a wreath- even though I’m not really into tennis. Two vintage tennis rackets are wired into an X shape and then wired to a mid-range, plain wreath.